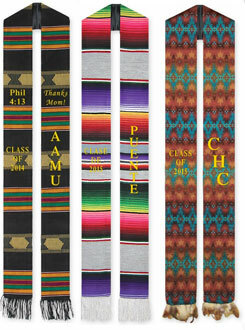 Custom ethnic sashes are 5" to 42" from neck to tip, and made with quality fabrics. You can choose the colors of the thread. And they can be personalized with your name, logo or custom message. 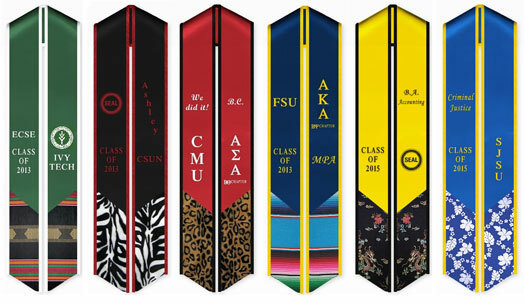 Blank ethnic sashes are also available. The kente sash is a printed kente design in black color, and comes with a black fringe. Made of traditional Mexican material. Serape color may vary. The sample image is for viewing purpose only. It comes with fringes. Hybrid designs are ideal to keep school color with the right amount of ethnic flair. It's also a good way to show your sense of style and make a statement. 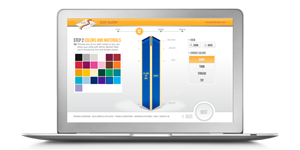 Customize the sash, trim and tip color or fabric and add your embroidered text. The variety of hybrid fabrics to choose from are: Camouflage, Rainbow, Asian (red, blue and gold), Asian Pacific (black, blue and red), Celestial (blue and red), Native American, Leopard, Zebra, Kente and Serape. Start Designing your perfect sash. See satin and greek stoles.